Liz moved to Kinlochewe in 1993 after retiring as a Geologist for an oil consultancy company in North Wales. 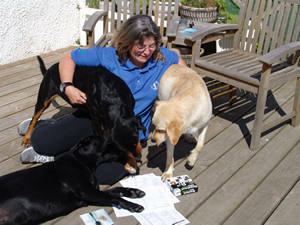 She now runs a B&B with husband Tom and front-of-house managers Bryn, Bracken and Jess. She became involved in Two Lochs Radio in February 2004 and initially only offered to read the Inshore Waters Forecast, following a life-long attachment to Radio 4's Shipping Forecast. Liz's extra-curricular activities include completion of a Masters Degree in Scottish History, specialising in emigration from Wester Ross to Cape Breton and getting out into the hills. Liz presents Westering Home on Monday afternoons. She also edits our daily mountain weather forecast, handles post-production work on our daily Bible readings, First Light.